Oh be still my heart!! 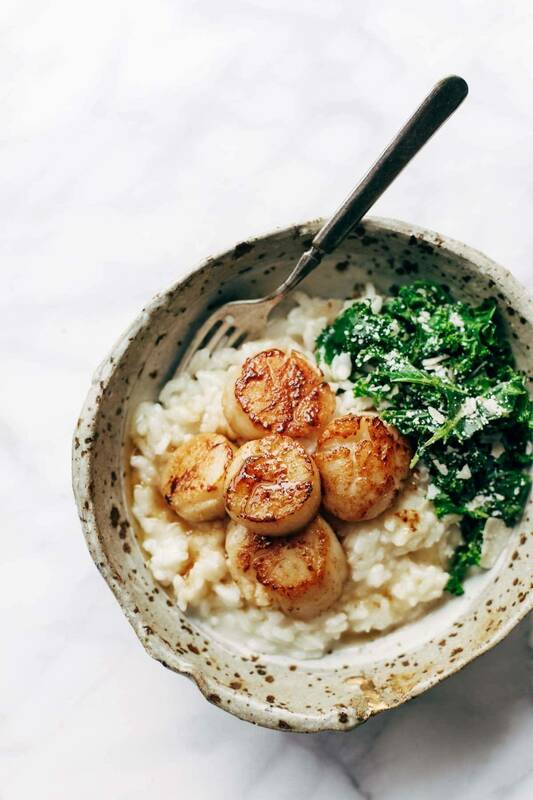 I adore scallops but haven’t had them in soooo long because let’s be honest – they’re not exactly wallet-friendly. However, these look so good that I’m most definitely making this dish happen soon. Your golden sear looks so perfect!! I love a good scallop but these look phenomenal! And with that beautiful golden glaze of browned butter? YUM!! Haven’t tried Scallops before, but this dish make me want to dive into a scallop cooking adventure. A must try dish. Thanks. i can never get scallops seared (aghhh), and though they still end up delicious, i’m ready to conquer them. you make it sound so easy, and your scallops are so fabulously burnished that i believe it could actually work at home!! Ha – easy might be a stretch, but I have full confidence that if I can do it, you can too! It’s nothing you’re doing wrong, it’s the scallops. It’s like you knew that I was looking for a scallop/risotto recipe to make for Xmas Eve. This looks beautiful and delicious!! why yes! yes I did! Oh man, serious fancy restaurant status here. This looks AMAZING! Also – I made your falafels and magic green sauce for dinner a couple nights ago with some brown jasmine rice + veggies and it was PERF. Thanks for the recipes! They’re always so good. Oh I’m so glad to hear that Lucia! There’s nothing like a nice seared scallop. When I used to work in the restaurant biz, we would actually make sure the oil in the pan hit smoke point (you could see light smoke off the pan) before putting the scallops in, because you’re right, those bad boys can stick! So fun to hear that from a REAL restaurant girl! Thanks Nicole! This looks so delicious I want to leave work now and get started on dinner! hahah yes! you and I both. OMG, that looks amazing! 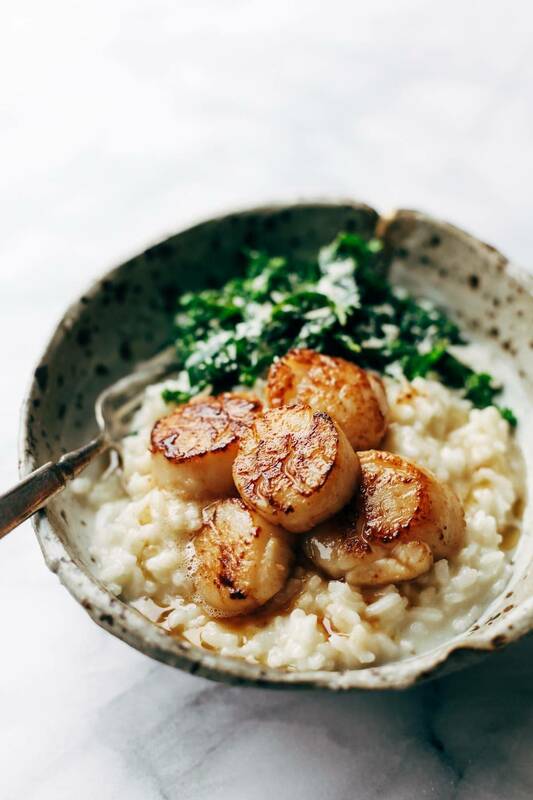 I am obsessed for risotto (no exaggerations) and I love scallops, but I have never made them, because I am afraid to mess it up. But I have to give this a try though! It looks so delicious! It did take me a few tries, but what’s cooking if not one big adventure? 🙂 haha! good luck Ana! hahaha good call Tonya! You will love them! YUM!!! Scallops are everything. I’m totally craving this right now! Where are those bowls from? They are amazing! Please let us know once they are available to buy !!! 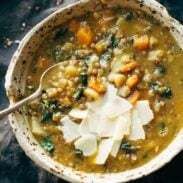 Am cooking this dish as I write this – it’s our anniversary and a cold night here in Georgia so thought I’d do something special. Curious if your father in law is selling his dishes yet? They are gorgeous! I just want to eat bowls and bowls of this! I’m completely drooling as have a weakness for scallops but never get a chance to order them for a restaurant or buy them from the store very often. This is your time! Enjoy Chels! I have had scallops a total of ONE time in my life. It took me 10min to get up the nerve to eat them. Then there were texture issues. And then after the entire process (because it indeed became a process) I decided I kinda loved them. Pointless story…but this recipe may have me heading down memory lane for that process all over again LOL. Yum. Oh, I love scallops and this looks really good. I will give it a try! Thanks Maria! Hope you like it! And those bowls are gorgeous. I have homemade ceramic pie pans and people always comment. They add such a unique touch to the dish! Made this tonight for NYE – so good! I love scallops but had to sub in shrimp (scallops were $30/lb, what?!) The brown butter on top made it amazing. We gobbled it up in no time. Thanks again Lindsay! Brown butter in anything is just amazing! To fulfill my eternal devotion to brown butter I have to make this! Looks os good! I have had scallops but I have never made them. I will have to give it a try! Yes – must try! 🙂 Enjoy Emily! These are perfectly seared scallops! 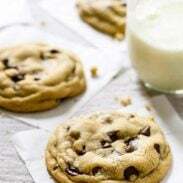 Browned on the outside, soft on the inside – looks amazing! Oh My!! This looks wonderful…..